Home to idyllic beaches, breathtaking temples, wild jungles and heart-warming hospitality, it’s no wonder Thailand is one of the most coveted travel destinations in Asia. With so much on offer though, it can be overwhelming to decide exactly where to travel in Thailand. Are you an adrenaline junkie searching for adventure, honeymooners looking for a little romance or a family searching for a fun getaway? Whatever your desires, we’ve come up with a complete overview of the 3 top destinations in Thailand (Krabi, Phuket and Koh Samui) to help you decide which Thailand destination suits you best. Let’s get your mind clear and your bags packed. Located on the west coast of southern Thailand, Krabi, which is one of the 3 top destinations in Thailand, is ideal for the thrill seekers, the nature lovers and the budget conscious. Just over an hour’s flight from Bangkok, this picturesque province is renowned for its spectacular beaches, hidden caves and lagoons offering a breathtaking backdrop for sea kayaking, rock climbing, snorkelling and diving. If you’re more of an ‘on land’ adventurer you can trek through dense tropical forests, admire awe-inspiring limestone cliffs, or take a dip in the natural hot springs of Klong Thom. Krabi’s charming town at the mouth of the Krabi River, also offers an array of culture from riverside markets, authentic Thai cuisine and gift shops selling traditional trinkets. For a night out on the town, Karbi bears itself to an abundance of vibrant, yet peaceful open-air cafes and bars. If you are wanting to bring out the party animal in you, then the dynamic island of Phi Phi is just a quick 1-hour ferry ride away. Moreover, Krabi is believed to be an affordable destination where you could find numerous budget food and accommodation options – for example, even luxury holiday villas in Krabi are really affordable. Feeling thrilled? Check the list of the things you need to know before travelling to Krabi. From its picturesque beaches, longtail boat rides, breathtaking caves and rock climbing spots, this area is perfect for the adventurer. Averaging about 35-40 degrees these thermal hot springs are surrounded by stunning rainforests and brimming with natural mineral salts. Just a short ferry or speedboat ride from Krabi, Phi Phi is one of the best islands in Thailand where you can either relax on the beach by day or kick up your heels at the bars by night. Welcoming you with a steep 1260 step staircase this temple will take about 30 mins to reach, but reward you with a stunning golden Buddha and spectacular view at the top. With an abundance of restaurants, markets, museums and gift stores, you can get lost in traditional Thai culture in this quaint, bustling town. 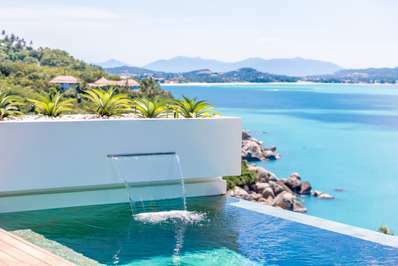 Nestled off the Gulf of Thailand, Koh Samui is perfect for families or couples wanting some romance, rest or rejuvenation & lovers of luxury island beach holidays. A quick 1-hour flight from Bangkok, this island paradise boasts an array of luxury resorts, beachside bungalows and world-class cuisine to suit a slightly higher budget. With coconut tree lined beaches, it’s the perfect spot to take in the views, work on your tan or doze off in a hammock. This, of course, ensures its position on the list of the top destinations in Thailand. Welcome to fabulous Koh Samui! The island also offers an array of attractions and landmarks to explore from breathtaking waterfalls, quaint fishing villages, traditional temples and national parks. If you want to be entertained in style, Koh Samui doesn’t disappoint. Known for its indulgent restaurants, trendy pubs, luxurious holiday villas with infinity pools and classy beer bars, you won’t be short of islander style nightlife in Samui. A majestic set of two cascading waterfalls surrounded by lush green rainforest. This hidden secret is easily accessible by car and then a 30-minute walk to the fall where you can take a refreshing dip. Featuring towering limestone mountains, thick jungle, white sandy beaches and waterfalls, this National Park is also home to a rich variety of exotic animals and sea creatures. This 12-metre seated Buddha was built in 1972 and is one of the islands most popular attractions. A symbol of purity and enlightenment this temple is a must see in Koh Samui. This quiet, sleepy town is brought to life every Friday from 5pm-11pm with its array of eclectic market stalls selling souvenirs and mouthwatering Thai street food. Considered the ‘baby’ of Koh Samui, this is one of the best islands in Thailand. A magnificent diving spot you can see a huge array of marine life from stingrays, reef sharks, turtles and barracuda. Situated on the west coast, Phuket is one of the best islands in Thailand suited to families and couples wanting a little bit of everything on their holiday (from the beach time to nightlife and culture holidays). It’s believed to be one of the top destinations in Thailand for a good reason: Phuket literally has it all, which attracts tourists from all over the world. 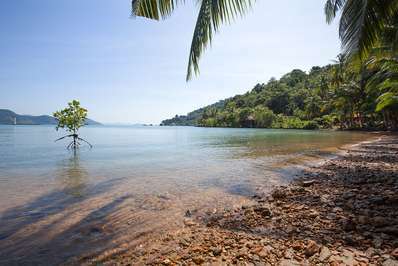 With over 35 beaches, Phuket offers a range of isolated coves, scuba spots and beaches with a ‘let’s party’ atmosphere. Even the accommodation options are designed for every budget and style from luxury eco resorts to Thai style villas and backpacker bungalows. With a multi-culture of influences throughout its history, Phuket Old Town’s shopping and dining scene is as colourful as its streets. Offering an array of markets and street food stalls you can take in the culture while tantalizing your taste buds with ‘if you dare’ curries and local delicacies. Bursting with culture and a vibrant nightlight, this is one of the most popular choices when deciding where to travel in Thailand. With distinctive cliffs, caves and archaeological sites, this Bay is also the entrant point to some of the best islands in Thailand including the infamous James Bond Island. Full of personality, this rich town is overflowing with ornate shrines, quaint cafes, Buddhist temples, and restaurants to keep you busy right throughout the day. Sitting on top of the Nakkerd Hills between Chalong and Kata, this 45-metre tall landmark will truly take your breath away. Offering 360 views from the top this is a must-visit island destination. Would you like some exotic fruits? Night market in Phuket is here for you! If you’re up for a spot of shopping, the Phuket weekend market is not to be missed. The largest night market on the island you are guaranteed to find everything from souvenirs, clothing, vintage furniture and incredible food.